On Boxing Day he decided to place a sign on the road reminding interested parties what they were in for. He was just informing home buyers of "what's around them", he said. "At least there will be no surprises." The family runs 3000 pigs over two nearby sites on Highcliff Rd and Centre Rd. "The worst times are when there are very still nights and the ventilators are going. You'd definitely know there's a pig farm here." The sign "wasn't exactly original" as he had seen the concept on internet farming pages. He had good relationships with most neighbours but a couple were "more difficult", he said. Mr Bloem was told by the Otago Regional Council there had been 65 complaints about his property within the last 10 years. He imagined most related to smell. In 2010 he was fined $6900 for the odours emitted from spreading effluent on grass. "We were maybe a bit naive about what we could be doing." His was an ongoing battle regarding the reverse sensitivity of properties being built in formerly rural areas. It could get worse as under the new Dunedin City Council 2GP district plan as part of the area would be re-zoned as rural residential 2 rather than rural. This would mean about three more neighbouring properties could be built, he said. "DCC have made a concession that they won't approve a building less than 100m from our boundary. It's better than nothing, but I'd be happier if it stayed rural." Owner of the for-sale property Paul Doudle lives in Temuka but goes to the peninsula on holidays. He laughed when he was read the sign. "Yeah, I have no problem with that if that's what he feels he had to do. People need to do their homework about what's around them, in my book. "You get a bit of a smell occasionally, but I've never had any noise or anything like that." One potential buyer, speaking anonymously, said they found the sign "more amusing than a deterrent". Neighbour Christine Scott said she lived across the road from the farm for 34 years and had "never had a problem". 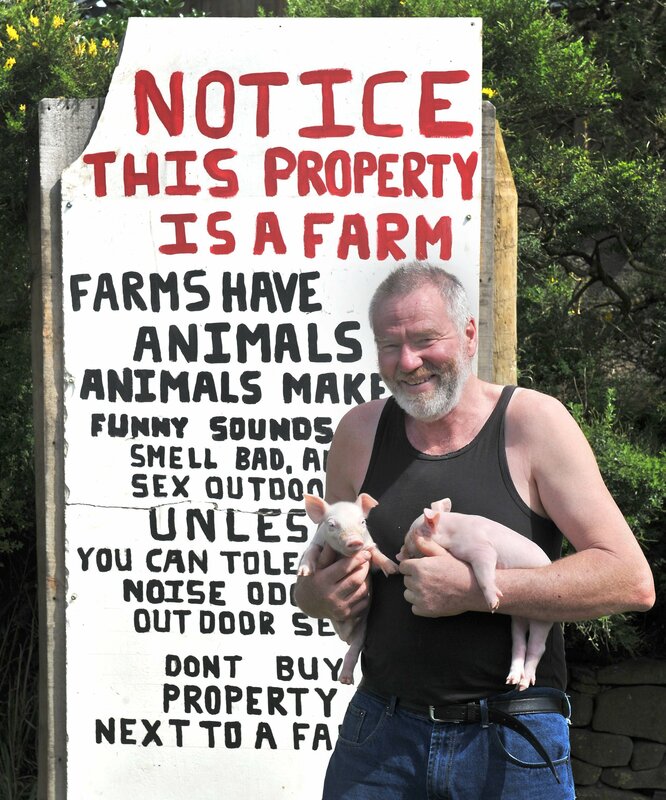 "When we came here we chose to live along the road from a pig farm." She thought the sign was "hilarious" and it was a "really good idea" to remind people about where they could be potentially moving.